Gary Ling, Digital Producer, Data Monetiser, Political Savant, Information Economist, Solution Seller, Business Strategist. 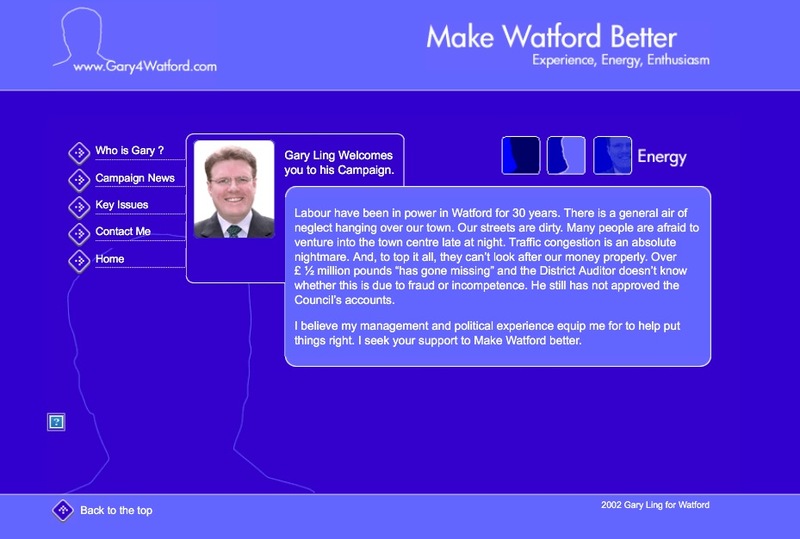 - Gary Ling's Wonderful, Wacky Watford World! 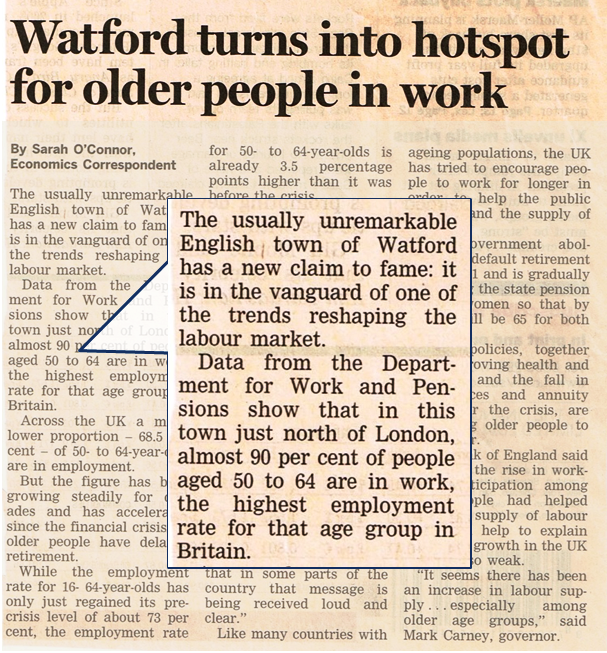 The Financial Times publishes more evidence of why Watford's Great Work Ethic makes the town one of the most industrious places in the world. If you live here, it is something inculcated early on. For example, after delivering morning newspapers, my first Saturday job, aged 13, was as a potato boy working for Brown's greengrocers in Watford Market. I would be picked up from the bottom of my road at 0400 by Len and Chris Brown, driven to London's Covent Garden vegetable wholesale market (now fancy wine bar territory), load up the lorry with fresh produce, be fed tea and a bacon roll, then return to help set up the open air market stall. My great memories of this time are only jolted by the fact that the older boys would often pin me down atop the sacks of potatoes in the storage area out back, take off my Doc Martin boots and tickle my feet. Otherwise that Great Watford Work Ethic has kept me employed ever since! Winning With Watford's Wise Wacky Wilful Wandering Wannabes! A cheesy Looking Mayoral Candidate in 2002! 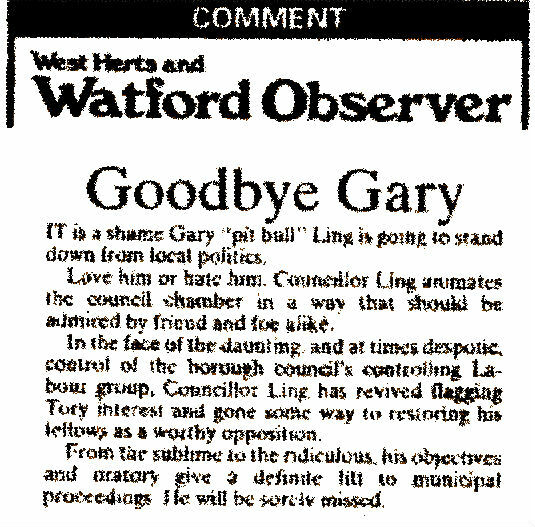 One of the most fun times I have had politically, was standing for Mayor in Watford, England, a market town in the County of Hertfordshire where I grew up and where people with airs and graces end up with sad faces. Watford is a place which typifies the very best of what England has to offer. As one of the most densely populated towns outside of London, the 91,000 inhabitants of Watford are a melting pot of almost every nationality or ethnic group that lives in the UK. According to the local newspaper one school is attended by children who speak 23 different languages or dialects. The Town is served by some of the best state schools in the country (Watford Boys' and Girls' Grammars, Parmiters School - exceptional in Maths) and several private schools that rank high in league tables (York House Prep School, Merchant Taylors, St Albans Boys and Girlâs). Famous Winning people associated with Watford really do personify the place in that they are Wise, Wacky, well travelled (Wandering), determined (Wilful) and ambitious (Wannabees). Famous soccer player, Gazza Ball grabber (try Googling it!) and hard man actor Vinny Jones is from Watford. Ginger Spice, Gerry Halliwell is also a local lass. High Street Shopping Guru Mary Portas is Watford born and bred. Heavyweight boxing prospect and Olympic Gold medal winner, Anthony Joshua, learned to punch whilst living here. Most importantly, my Town even has its own Queen! Sir Elton John is Life President of Watford's successful Championship football side. Beat that Luton! Congratulations to Sir @eltonjohndotcom the Queen of #Watford on his marriage to #DavidFurnish http://t.co/eiBJLawPGK Go For it #RocketMan! This London Underground poster doesn't say but come see Harry Potter in Watford! Anything that matters - movies, technical innovation, politics, major product launches - happens within this circle of influence. The Harry Potter (Warner's Bros) Studio Tour is in Watford and each day a big 'Harry Potter' branded double decker bus disgorges thousands of Potter fans to the vast sound studios on the Watford lot for a Hogwarts tour. On the same lot in any given week, you can often see and hear the sound effects where major movies with big stars are being filmed for later global distribution. Like driving? Watford intersects the M1 - M25 motorways and is 11 minutes from the M40, 20 from the M4 and 30 from the M3. More importantly, the town lies within the M25 - the UK's major road artery that circles its capital city. In geographic terms if you like the 'north' but don't want to live there, then Watford is the place for you. England's second city, Birmingham, is 70 minutes away by fast train from Watford Junction. Liverpool, Manchester and the Lake District are destinations that demand no train switching and Scottish Caledonian Sleeper stops at the Junction each night so you can go to bed in Watford and awake in Inverness! Southern seaside towns more your cup of tea? Get a train straight to Brighton and avoid central London altogether. 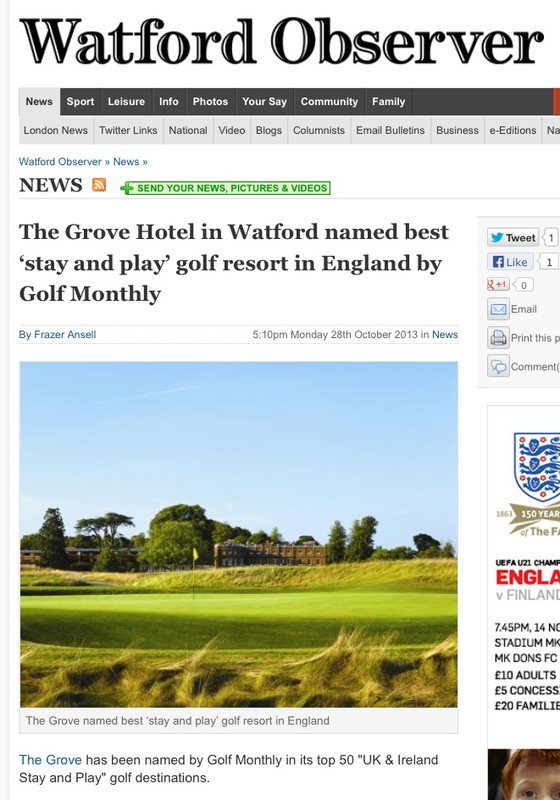 The Borough of Watford personifies the very best of what England has to offer. As one of the most densely populated towns outside of London the 91,000 inhabitants of Watford are a melting pot of almost every nationality or ethnic group that lives in the UK. Gary grew up in Watford until he was 14 when his parents debunked to Greenwich, CT USA (See The TOB Rule 1: Play Ball). He returned 4 years later and, although well-travelled, has called the town 'Home' ever since.